Designing the perfect banners for promoting your business can be a daunting, but incredibly rewarding task. A quality banner design will not only add a more attractive element to your business and extend your brand image, but it can also entice many new potential customers to walk in your doors. 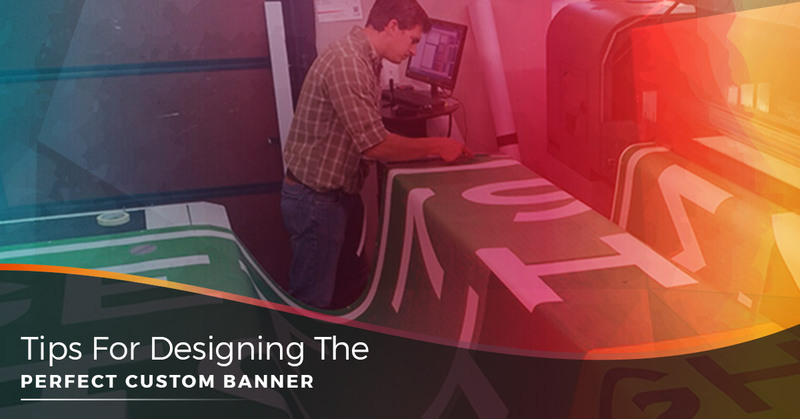 If you think your business could benefit from custom banners but don’t know where to even begin, here are some steps to follow from the banner printing experts at Illustrative Ink that you can use for getting the ball rolling and igniting your inspiration. If your business is in the Biloxi area or anywhere around the Mississippi Sound, reach out to our team today to get your free estimate on custom banner designs. Step 1: Will Your Custom Banners Be Indoors or Outdoors? There are different aspects that can affect your banners depending on whether you choose to have them hung inside or outside. For starters, you will want to choose the banner material that is best suited for your specific usage. Vinyl banners are more common for indoor usage as their colors really pop, while mesh banners are a rugged, long-lasting option for leaving outdoors year round. People also read and interpret business banners and signs in different ways depending on their location. You will want to choose a different design for an outdoor banner that people will be quickly passing by than you would use for one that is located indoors in a waiting room, for example, where they have sufficient time to examine the fine details. By keeping the end viewer in mind when designing banners, you can ensure that you maximize visibility and the potential impact they can have. Readability is one of the most crucial factors in developing a quality business banner. Since the majority of banners are meant to be viewed from a distance, you will want to select a typeface that is easily readable from any angle and range. The general rule of thumb at our print shop is to stick with sans serif fonts, such as Helvetica or Arial. In order to test a font’s readability, you can type out your desired message on a monitor prior to printing, then slowly step backward and see how it sizes up. If you already have specific brand fonts, you should stick with these for a cohesive look — as long as the message is still legible. When it comes to selecting custom banner colors, you will want to choose a background color that compliments your business theme but also compliments the type in a way that improves the readability of your message rather than hindering it. When attempting to pair font colors with background colors, contrast is the name of the game. Keeping it simple is also key in most designs. Having more than three main colors used can make a banner appear too busy and deter potential customers from giving it a thorough analysis. Of course, if you choose to work with a quality printing company for having your business banners created, they will guide you in the right direction for this process. Simplicity is as imperative with the content of your banners as it is with the design. You want to communicate your desired message in a way that is as brief and easy to understand as possible. In lots of cases, having too much content to read on a banner will either lead to your message being misinterpreted or avoided altogether. You want your message to be relayed as quickly as possible. This way, those passing by and just getting a glance will still be able to gather everything you are trying to convey. So when developing the content for your banners, start with your full desired message, then find as many ways to trim it down, cutting out the unnecessary words. Lastly, but most importantly, choose a printing company that will have your business’ interests in mind as well as have the equipment and expertise to provide you with the highest quality final product. ©2018 Illustrative Ink® - Do not copy. All rights reserved.